The NBA and NFL are known as copycat leagues. The teams that win it all dictate the landscape of the entire sport. As you can see, NBA teams are looking to spread the floor like the Golden State Warriors while in the NFL teams want a loaded team like the Philadelphia Eagles. The same could be said about the MLB. The Chicago Cubs and Houston Astros are the frontrunners of the current fad in baseball which is to build a winning team with homegrown studs in Kris Bryant (CHC) and Jose Altuve (HOU). That is the new phenomenon in baseball as those two organizations have trusted in the farm system. The New York Yankees, Los Angeles Dodgers, and Boston Red Sox are mimicking the Cubs and Astros’ masterful initiation. Sure, they made splashy trades as well as free agent signings along the way. However, make no mistake they are good because of the players they drafted such as Aaron Judge (NYY), Clayton Kershaw (LAD), and Mookie Betts (BOS). The San Diego Padres seemed to have adopted that same build from within approach as they are in the midst of a rebuild. The first 50 games of the season might have been an all-out sprint to see how good the Padres were talent-wise. Eventually, a greater good came into play. Beyond the bellyaching and criticism for not having much success on the field in recent years, the Friars’ front office has continued to stick to their guns. However, make no mistake their hat lies on the coat rack of endless possibilities that lie in the future. According to Baseball America, the Padres have the top-rated farm system in the entire league. They have Fernando Tatis Jr., Francisco Mejia, McKenzie Gore, Luis Urias, and more players to be enamored with. It will take some time for them to develop, but Rome wasn’t built in a day. In addition to having a top tier farm system, the Padres have a young crop of major leaguers. Just look at the roster. The Friars have four rookies that have each had their own shining moment. Joey Lucchesi had the playoff hopeful Phillies stomped on August 12 in which he held them to two hits in a win. Eric Lauer nearly went the distance in 8.2 innings pitched with eight strikeouts on July 10 against the Dodgers. For both young pitchers, Padres’ manager Andy Green is confident his young tandem can continue to master the mechanics of being a pitcher. Also, he has been vocal about seeing them continue to craft specialty pitches beyond the fastball and change-up. Meanwhile, Christian Villanueva and Franmil Reyes have a combined 29 home runs as the other half of the rookies. For the hitting twosome, it’s about being more than a long-ball threat and adjusting to pitchers and catchers knowing what they are looking for when they step into the box. The rookies have had their ups and downs, but that is just a part of the growing pains the Padres’ organization knew they would have to endure. Consistency will be key in their growth. 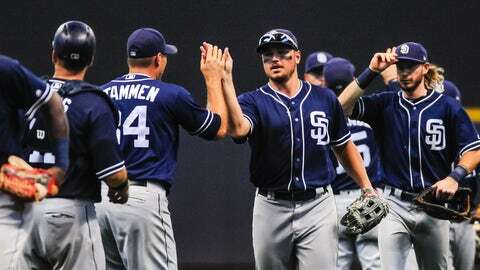 Manuel Margot, Austin Hedges, Travis Jankowski, Hunter Renfroe, Cory Spangenberg, and Matt Strahm are young players who have at most four years of experience in the MLB. That means they haven’t hit their ceiling yet. It takes more than two or three seasons to get into the full swing of being a pro. San Diego’s more experienced cast won’t even be 30 next season. Since the All-Star break, Freddy Galvis and Eric Hosmer are both batting .280 or above. Wil Myers was a victim of the injury bug, but when he is healthy he provides another power source to the lineup. On the contrary, Hosmer should be more settled in his second season in with the team in 2019 as he will be a bit more acclimated to the terrain. Galvis is a free agent this summer so it remains to be seen what will happen with him. The Padres have a lot of promising talent. The Astros and Cubs went through their roller coaster of events, now they have rings to show for their commitment to winning. For the Padres and fans, it’s about staying patient and being hopeful that the back-end of this rebuild is similar to that of Chicago and Houston.